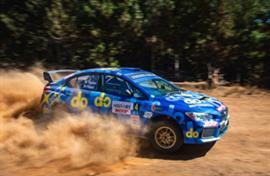 Subaru do Motorsport team has finished in overall fifth place* in the Make Smoking History Forest Rally, in Western Australia. The team finished Heat 2 in sixth place today, in the first round of the 2019 CAMS Australian Rally Championship. Molly Taylor talks about Heat 1 of the 2019 Make Smoking History Forest Rally.